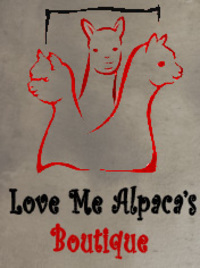 We will Gladly Mail you out fleece samples of his offspring so you can see for yourself what he is capable of doing. There's talk in 2017 there's a Down word trend of staple length , and that's bad! All of CROWNES crias had High complements at the WISCONSIN ALPACA SHOW about how long the staple lengths are , Dencity & Bright silky Fleeces. People Breeding for finness your losing staple length! We need that!! Check out Royal Gold Dust he's one of CROWNE'S 2016 offsprings. Crowne is an A+ huacaya male on the farm!! ( we had him evaluated). 2015 shearing weight of fleece 11 1/2 pounds WOW! blanket over 6 1/2 pounds!! His list of girls are lining up you should consider breeding to him. AFD 21. Royal crowne truly elite Genetics!!! Staple length is 5 1/2+ inches WOW and Dencity! 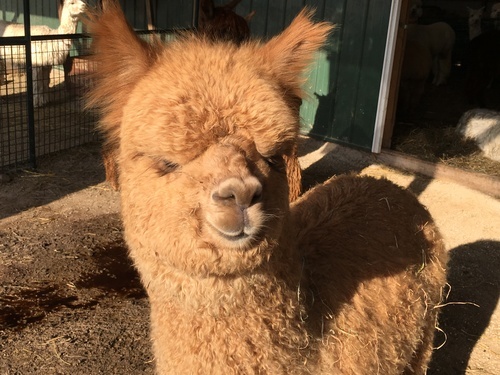 Crowne is a compact male that produced 11 1/2 pounds of fleece !! for 2015 shearing and 2016 shearing. Royal Crown has matured into a beautiful young male. 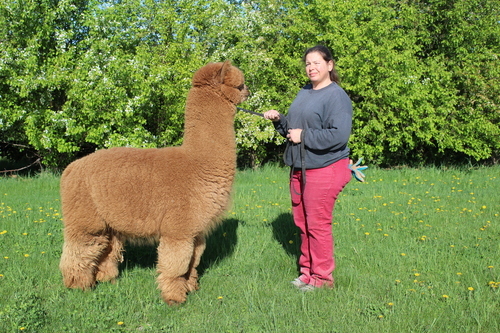 His fleece has evolved in to a high frequency crimp that is "Incredibly dense" that will retrains fineness. The "Only" Snowmass Royal Pacuna Son in this area. There are 2 sons of snowmass Royal Pacuna we have the other one. Yukon jack is the other. 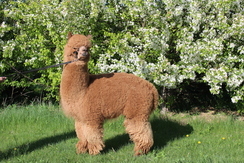 Snowmass Quechua's Vicuna Granddam on SIRES side only had 3 crias. . So the Genetics are rare. Crowne's first cria AVA is here a bueatful light brown girl! Read about her an abbies page. AVA will be going to the AOA NATIONAL SHOW!2016. 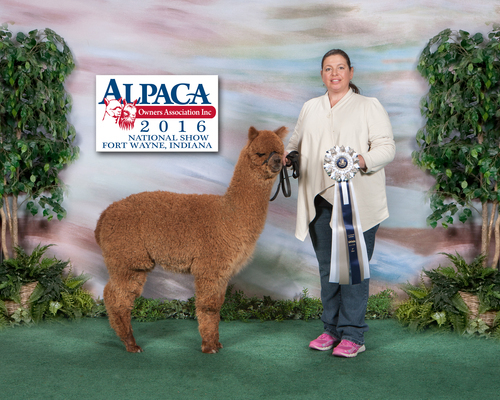 CROWNS first cria going to the biggest show! Breeding to him you can be apart of that next year. AVA PLACED 3RD AT THE 2016 AOA NATIONAL SHOW YOUNGEST ONE IN CLASS & in the same class as the NATIONAL CHAMPION!! 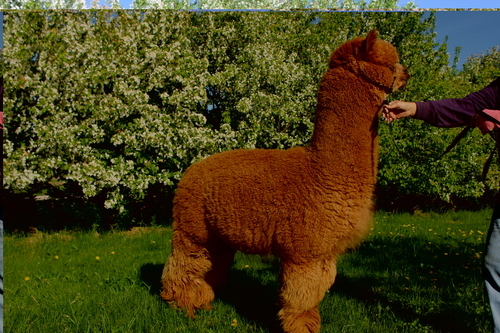 BEAUTIFUL BRIGHT FLEECE, FINE , DENCSE. ... AVA has a nice solid square frame. There are 4 more crias on the ground . All I can say is WOW! He's letting color pass on. Both White females both light/ med fawn crias and with colored female there same color as moms. The brightness and the bundling of the fleece and soft and fine!